Is it Friday yet? Because it feels like it should be Friday. Anyone else feel that way? Eeeeeeesh. It’s been a long week over here already. In fact, yesterday felt like two days crammed into one. Maybe even three. It was rough to say the least. The baby was super cranky and pretty much everything I tried to do was a total fail. I won’t bore you with the details, but it was definitely a kick in the pants kind of day. I’m hoping today goes MUCH better and we just steam roll right through the second half of this mediocre week. But first let’s chat about pumpkins and pretty fall things, ok? Today’s post is one that is super simple and I almost didn’t even share it because I wondered if it’s too simple. Is that such a thing? Decor that’s too simple to even blog about? Probably. And I might be pushing the boundaries with this one, but I figured I’d share it anyway because I know you guys appreciate simple just like I do! So you might remember that I found this corner cabinet at an antique store in my hometown earlier this year. It was one of my best finds ever and I’ve been anxiously waiting to style it up with a few pretty things for fall. I (obviously) kept it super simple and basic because I didn’t want the decor to distract from the beauty of this piece. 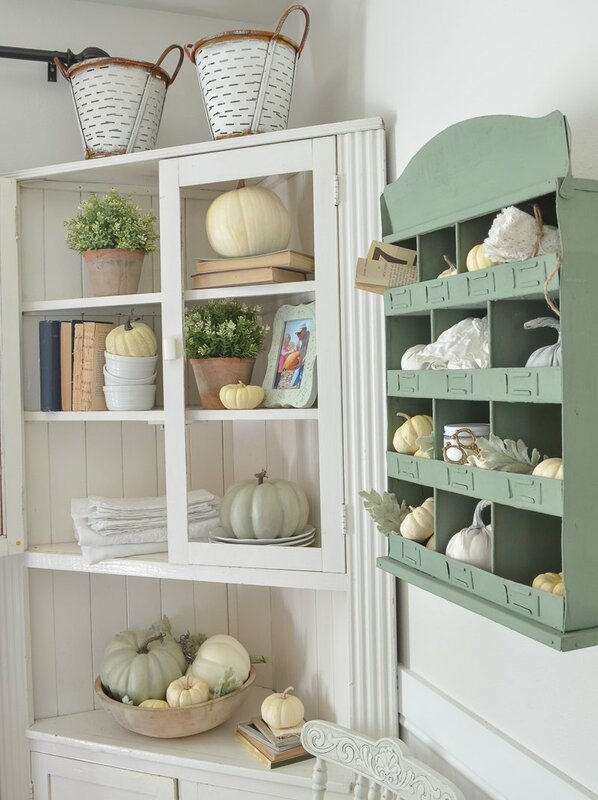 I think too many pumpkins would have made this cabinet look cluttered. I love this picture of my dad helping my daughter at a pumpkin patch a few years ago. It brings back so many sweet memories and it’s the kind of photo I’ll cherish forever. 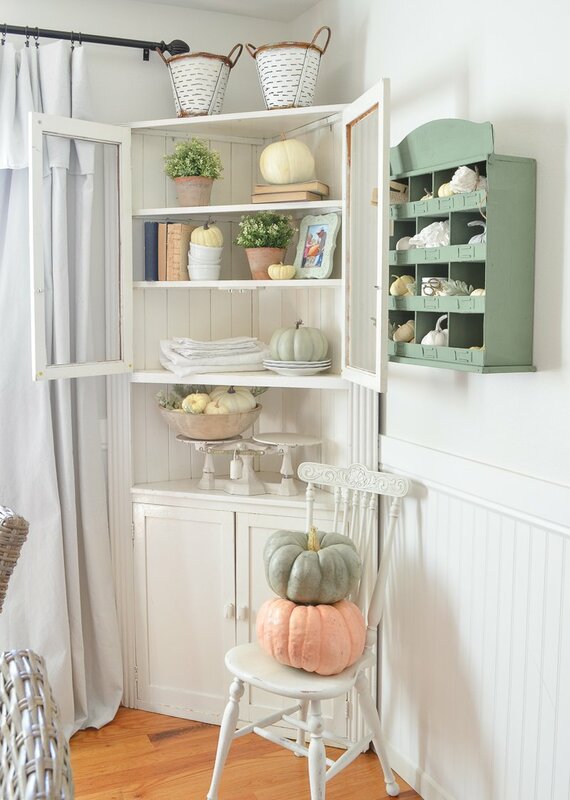 I just love using it in my fall decor. I actually found that pile of antique table linens at a local consignment shop a few weeks ago. They were bundled up with a hand written note (in old the most beautiful old lady cursive) that said “12 napkins and a table cloth–80 years old”. How neat is that? I love them. Even though this corner is super simple, I still think it’s beautiful. 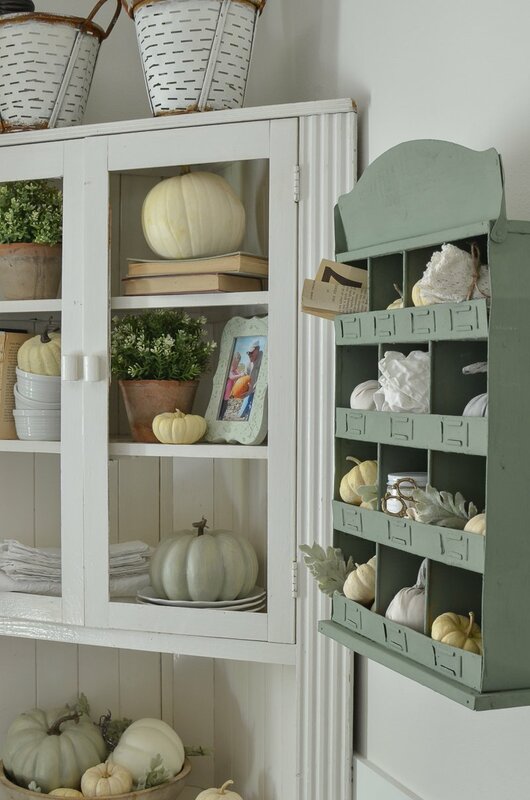 That old antique cabinet steals the show in my opinion, so it doesn’t really need a lot of flashy fall decor. 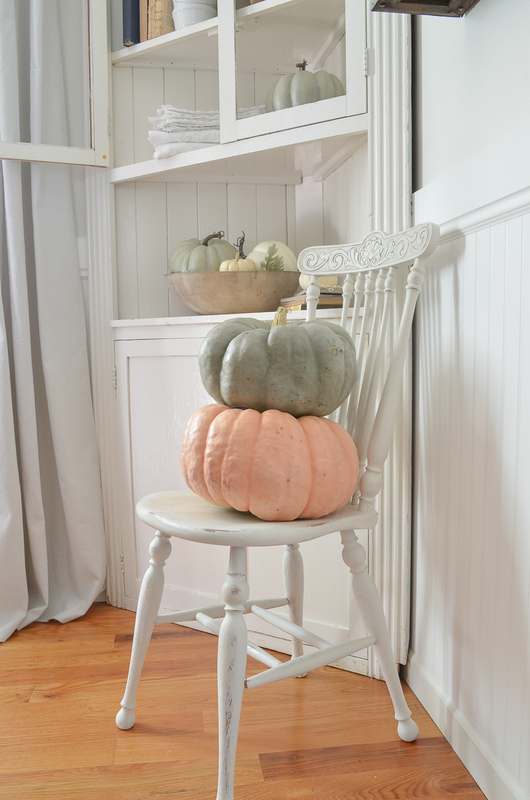 I actually styled this with a few orange pumpkins at first, but they just weren’t working so I took them out. 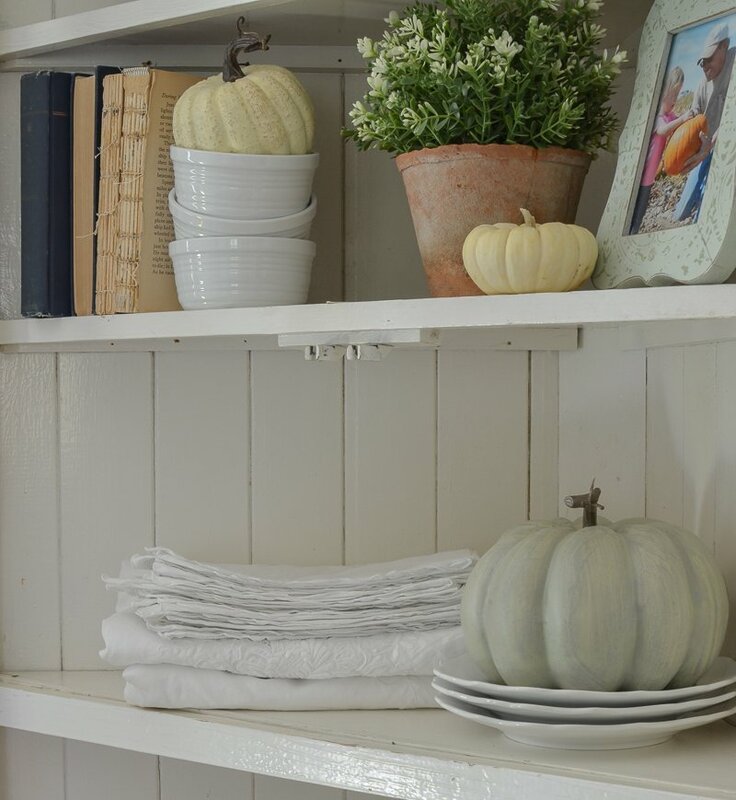 They were too bright for this spot, so I kept it more on the mellow side with just a few neutral pumpkins, a stack of antique table lines, and that photo of sweet times at the pumpkin patch. Simple! I love the muted tones you used, that’s right up my alley! I’m constantly amazed at the decorating ideas you come up with, absolute genius! You definitely have an eye for design. Thanks so much for sharing your ideas with us. Simply put your ideas are so inspiring. I have an old antique mirrored buffet in my front entry. 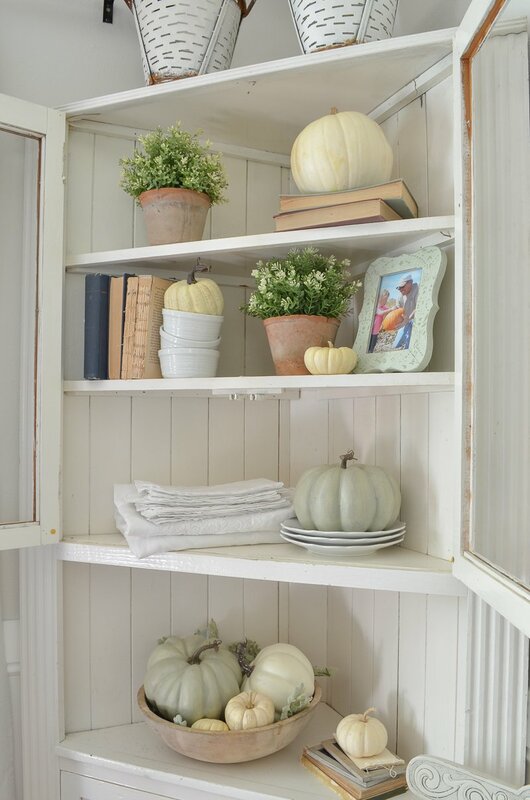 I now know just how to display and bring the fall season into my home. Thank You. Everything looks wonderful and so cozy. I love following your home decor style. Thanks for sharing! Hi Sarah, Love the look you are going with for this fall season. I too am doing alot of muted tones. 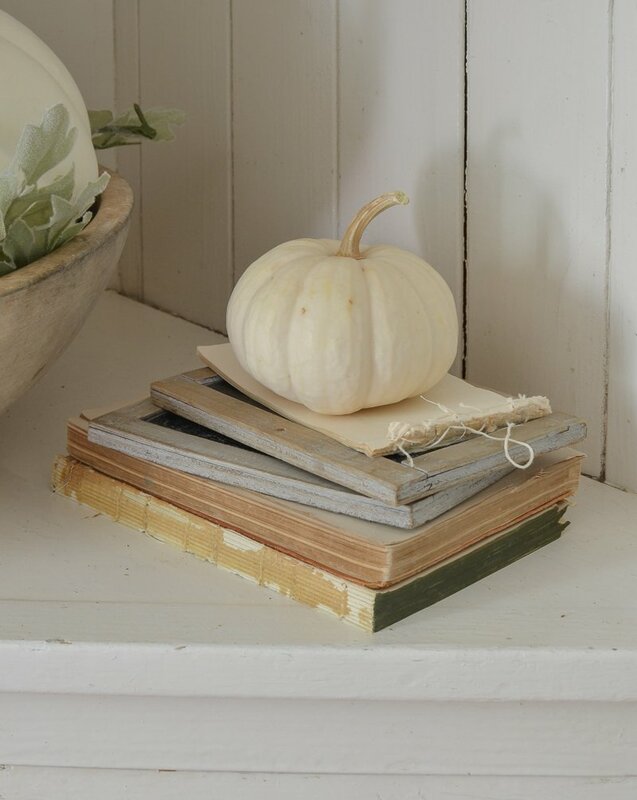 I have alot of fall decorations but when its in the muted tones it blends beautifully and can use all of it. This year for fresh pumpkins I am going to buy the white as usual, but I am going to also get the green and pinkish ones also. I too as you know have alot of white furniture and walls and the muted, pastel colors are just beautiful. Beautiful! Sometimes simple ideas are what we need in our busy lives. 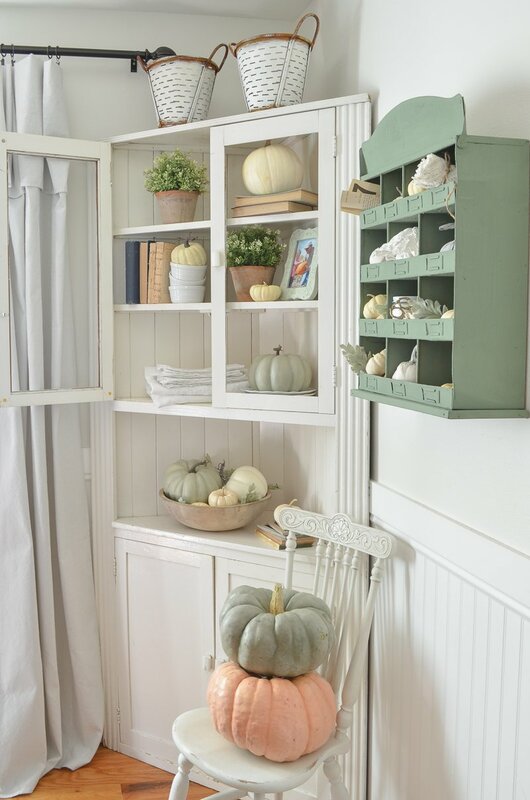 Decorating should be fun and not stressful. 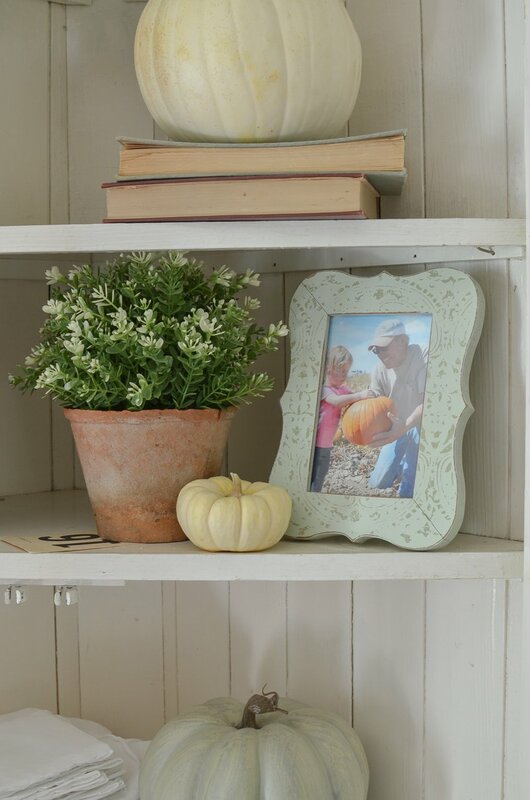 I also love to incorporate seasonally appropriate photos into my decor. My kids are 22 and 19 and I have a photo I took of them when they were 3 and 1 sitting on hay bales in front of our house next to a big scarecrow I made. My son is wearing overalls and a plaid shirt and my daughter is in her black leggings with a pumpkin shirt. I found a cute metal frame with fall leaves for it, and it’s is one of my very favorite things! I also bring out a a couple of framed Santa photos with my kids for Christmas. Family photos are the best decor❤️. I am so glad you decided to share. It is so lovely and just the way I like it. Did you keep the note from the linen? Would make a sweet remembrance. Just perfect in every way!